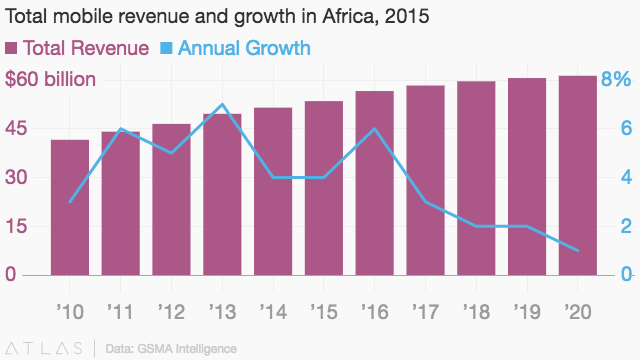 Telecom operators across the African continent continue to face significant risks when it comes to revenue growth. Despite the increase in mobile revenue, annual growth will continue to trend downwards over the next five years, amid increasing competition, currency volatility, and less reliance on texting and voice-based calls. On the other hand, African start-ups and incubators have continued to champion local innovation, introducing diverse products and services in education, insurance, remittances and health care industry. But most of these startups continue to face challenges like raising investment capital, reaching unconnected users or securing government support for their business models. Yet both African mobile operators and start-ups can help close these gaps and deliver maximum impact by working with each other, says a new report from GSMA, the association that represents the interests of mobile operators worldwide. While mobile operators continue to lag behind in innovation, start-ups in emerging markets continue to struggle to reach their scale or realize their full potential. So, merging the mobile operators’ powerful distribution and payment networks with the start-ups’ efficiency and high-impact models can pave the way for important and profitable synergies. “When it comes to scale and innovation, mobile operators and start-ups have certain “haves” and “needs,” which can complement each other. This support can come from telecoms in the form of investing or giving grants to tech hubs, or by organizing hackathons from which the winning entrepreneurs can be chosen to work with operators. Through some of these synergies, operators can boost their income, create some new sources of revenue, and even attract and retain customers from competitors. Successful examples of these already exist in some places across the Africa continent—and have proved profitable in some cases. In South Africa, MTN partnered with the University of Cape Town to start the MTN Solution Space. Orange telecom also funded the establishment of the Orange Fab accelerator in Senegal and partnered with mTick in Côte d’Ivoire to allow users to buy bus tickets through Orange Money. Orange also invested in AfroStream, a subscription on-demand video service that streams African and black diaspora films and programs. Kenya’s Safaricom, whose CEO Bob Collymore warned of the risks of not diversifying, partnered with M-Kopa to allow customers to buy solar lighting. The telecom giant also worked with Eneza, an education service that curates mobile courses for its 1.7 million registered users. The service is also available to over 26 million Safaricom users who can access it by dialing a number on their phone. Vodacom’s partnership with Teta Mobile Chat, an app where users can chat at no data cost, also allows it to attract customers and generate revenue through advertising. But most of all, these collaborations have the ability to transform small start-ups into unicorns, or startups valued at over $1 billion. For instance, the 2012 partnership between Swedish telecoms company Millicom and Jumia, the Nigerian e-commerce business, and the subsequent 2013 investment from MTN raised the profile of Jumia globally. In February 2016, thanks to additional funding from Goldman Sachs and French insurance group Axa, the Jumia Group became Africa’s first unicorn, surpassing a billion dollars in market value.